Domainplus Review 2019: Is Domainplus a Good Hosting? Domain Plus offers plans with basic features that are good for basic websites. However, they lack robust features larger websites need and their support is sub-par making them less than ideal for beginners. onClick="trackClickout('event', 'clickout', 'Vendor Page - Visit User Reviews', 'Domainplus', this, true);"
Good experience so far. I'm not the one to fuss much, but I like it when they get things done for me. Not too hard-sell with their promos and pretty much keep their current customers (like me) happy!They also have consistent blog tips to help online beginners like me. Keep up the good job! Great choice for new business owners! Domainplus always have really great promos. Plus, their support team is really friendly and helpful. Like how they get the job done at such affordable cost. 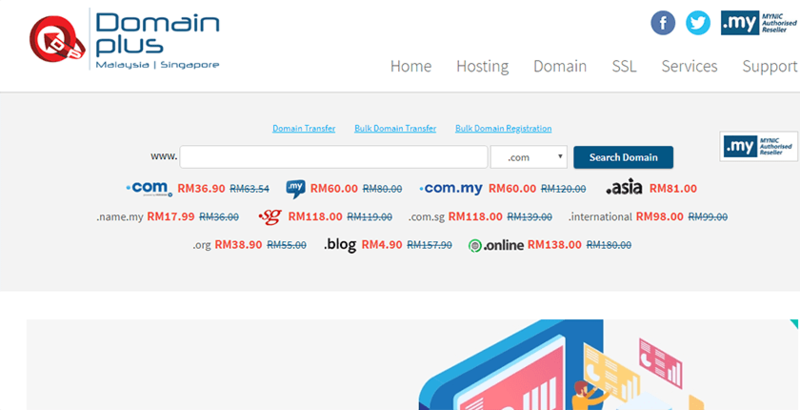 Domain Plus is a Malaysian website hosting service and domain registrar. They offer several shared hosting plans that are great for those just getting started or need a basic set of features. However, due to a lack of robust features similar to other services, they may not be a good fit for those needing robust features or more control over their hosting. One reason this is considered starter website hosting is that of the lack of advanced features for each plan. There’s no support stated for scripting and programming languages such as Python. It also lacks any type of emails tools for marketing, spam prevention, etc. There’s also no mention of any antivirus, firewall, or anti-DDoS technologies. The 99% uptime guarantee is a bit lower than the average guaranteed by other providers. If you upgrade to their top plan, you get a 99.9% guarantee, but why not offer this across the board? Regarding ease of use, it depends on how much you’re willing to pay. If you need a drag and drop builder, you’ll have to pay to upgrade to Weebly. Otherwise, the simplest tool is their Softaculous auto-installer. Everyone else will have no problem using cPanel access to create their website. Domain Plus offers five professional business hosting plans with the primary differences being storage and bandwidth. Here’s a breakdown of their plans. The eXcite1 and eXcite5 plans are their entry level plans, and while eXcite5 has unlimited domains, I would only host one or two sites, so as not to run into storage issues. The PowerBiz plans are your best option with the 100GB plan more than adequate for most websites, and only a couple bucks more a month than the SME25 plan. The two caveats are they don’t provide free domains or SSL certificates. You must pay for your domain name or transfer one over that you already own. Also, you must purchase SSL certificate for each site owned. Domain Plus offers website building services through Weebly, but they are an additional fee on top of your standard hosting package. Unless you plan to use their free limited Weebly plan, you’re essentially doubling your per month cost by adding the Weebly website builder features. Support for Domain Plus is below average compared to other companies. They presently only offer ticket support for customers with no ETA listed on responses. There is a robust knowledge base available covering many technical topics. Don’t bother using their community forum as it has not been updated in months and appears to only serve as an announcements page. I’m not fond of services that don’t offer either phone or live chat support, and unless you’re technically adept, this host should go to the bottom of your list for that reason alone. Overall, you’d think that Domain Plus would be a solid choice due to their ample bandwidth, large storage capacity, and unlimited databases. However, they lack many advanced features offered by other providers, and their support is substandard. Unless you only need a basic host with large storage capacity, this is probably one to avoid. Wondering how Domainplus stacks up against other Web Hosting companies? Enter any other Web Hosting company and we will give you a side-by-side comparison.